"Contrary to majority belief... Universal Laws are not based on theory or speculation. What at one point was believed to be only theoretical, mystical, or spiritual in nature and understood only by those who learned to tap into the place from where "Higher Truth" comes, has now emerged and become evident in the latest scientific discoveries and is now being measured on a physical level"
Universal Laws, also referred to as Spiritual Laws or Laws Of Nature are the unwavering and unchanging principles that govern every aspect of the universe and are the means by which our world and the entire cosmos continues to exist, thrive and expand. Although I'll be referring to these "laws" here as Universal Laws, even though they do brandish many labels, what you might choose to call them individually is really quite immaterial. What IS important is that you understand that they do exist and should you choose to align and harmonize with them in a conscious and intentional way, you'll in essence flow with and learn to be grateful even, for each event, condition and circumstance you encounter as the various aspects of your life unfold. We'll be exploring how and why that's "true" in greater detail as we progress. 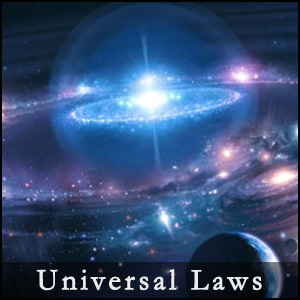 First and foremost it's important to grasp the fact that Universal Laws are just that, laws. What that means for you, me and everyone else means that there is no one or no thing in the entire Universe that exists, whether seen or unseen that isn't impacted, effected or determined by them. There are a large and ever growing number of people in the world who are waking up and becoming aware of these Universal Laws yet it's still the vast majority who believe that life just happens as it will. They "perceive" that the various events, conditions and circumstances they experience in life are based on a series of "random yes's and no's" regardless of how good or bad they might perceive them to be or are just a random series of occurrences altogether fully believing there's no definitive purpose or underlying reason why things happen as they do.